Bradford County Veterans Memorial Park Association member Joe Doherty (above) displays photos depicting the old Veterans Memorial Park in Towanda and an artist rendition of the new park under construction at the Towanda side of the Veterans Memorial Bridge over the Susquehanna River. 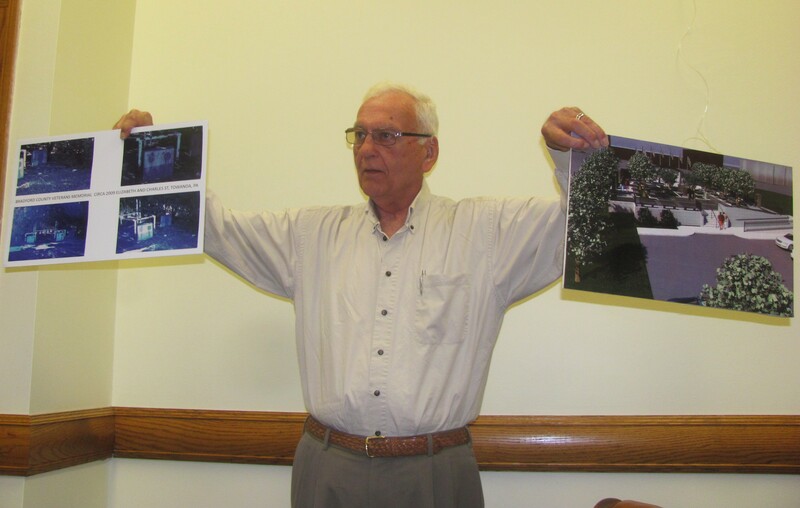 Joe Doherty of the Bradford County Veterans Memorial Park Association (BCVMPA) spoke at the July 24 meeting of the Bradford County Commissioners to update them on the progress of the park so far and the need for additional funding to complete the final phases of the design. 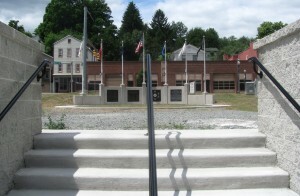 The first three stages of construction, which included the construction of a walkway under the bridge, a new municipal parking lot, a curved wall bearing flags and granite plaques, and an entryway with staircase and wheelchair ramp were fully funded with approximately $375,000 in donations. The installation of granite memorial pavers, which is also already funded, should take place within four to six weeks, said Doherty. The pavers, which initiallly cost supporters $75 each are in the process of being engraved. Additional pavers are available at $100 each due to the fact that a blank paver will have to be removed from the walkway manually to be replaced. What remains to be done, Doherty noted, will probably cost an additional $375,000. Additional work includes the purchase and installation of a large granite monument, a cast iron rotunda, and two statues. Support for the project has stagnated in recent months, and Doherty brought the matter to the attention of the county commissioners in hopes that they will support his intensified efforts to procure donations from the respective boards of Bradford County’s 51 municipalities (boroughs and townships). The municipalities are represented on one of the plaques already erected at the site. BCVMPA is hoping that each of the municipalities, which are represented on one of the plaques already erected at the site, can donate a percentage of its impact fee (Act 13) funds. “You have done a fantastic job down there,” Commissioner Mark Smith said to Doherty of what has been completed at the park. Commissioners Doug McLinko and Daryl Miller agreed. Engraved granite memorial pavers will soon be installed between the stairway and flag poles at Bradford County Veterans Memorial Park in Towanda. 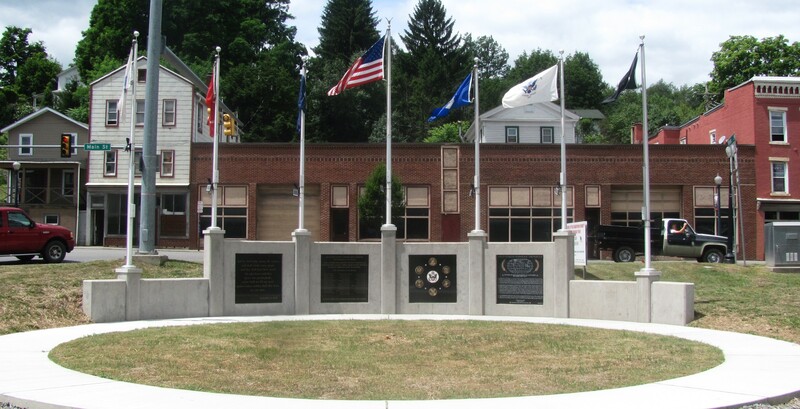 One plaque erected at Bradford County Veterans Memorial Park lists the 51 municipalities from which military veterans have hailed through the centuries. BCVMPA is hoping that the leaders of the boroughs and townships will donate a portion of the impact fees (Act 13 funds) received this year toward the completion of the park.